A Chinese port terminal is seen in Made island outside Kyauk Pyu, Myanmar, May 18, 2017. Days before the first supertanker carrying 140,000 tons of Chinese-bound crude oil arrived in Myanmar's Kyauk Pyu port, local officials confiscated Nyein Aye's fishing nets. The 36-year-old fisherman was among hundreds banned from fishing a stretch of water near the entry point for a pipeline that pumps oil 770 kilometers (480 miles) across Myanmar to southwest China and forms a crucial part of Beijing's "Belt and Road" project to deepen its economic links with Asia and beyond. "How can we make a living if we're not allowed to catch fish?" said Nyein Aye, who bought a bigger boat just four months ago but now says his income has dropped by two-thirds because of a decreased catch resulting from restrictions on when and where he can fish. Last month he joined more than 100 people in a protest demanding compensation from pipeline operator Petrochina. The pipeline is part of the nearly $10 billion Kyauk Pyu Special Economic Zone, a scheme at the heart of fast-warming Myanmar-China relations. Its success is crucial for the Southeast Asian nation's leader, Aung San Suu Kyi. Embattled Suu Kyi needs a big economic win to stem criticism that her first year in office has seen little progress on reform. China's support is also key to stabilizing their shared border, where a spike in fighting with ethnic armed groups threatens the peace process Suu Kyi says is her top priority. China's state-run CITIC Group, the main developer of the Kyauk Pyu Special Economic Zone, says it will create 100,000 jobs in the northwestern state of Rakhine, one of Myanmar's poorest regions. A local fisherman's family walks near a village at Made island outside Kyauk Pyu, Myanmar, May 17, 2017. China says the Kyauk Pyu development is based on "win-win" cooperation between the two countries. Since Beijing signaled earlier this year that it might abandon the huge Myitsone Dam hydroelectric project in Myanmar, it has pushed for concessions on other strategic undertakings — including the Bay of Bengal port at Kyauk Pyu, which gives it an alternative route for energy imports from the Middle East. 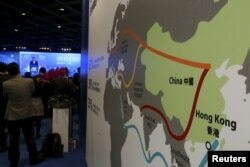 FILE - A map illustrating China's silk road economic belt and the 21st-century maritime silk road, or the "Belt and Road" megaproject, is displayed at the Asian Financial Forum in Hong Kong, China Jan. 18, 2016. Internal planning documents reviewed by Reuters and more than two dozen interviews with officials show work on contracts and land acquisition began before the completion of studies on the impact on local people and the environment, which legal experts said could breach development laws. 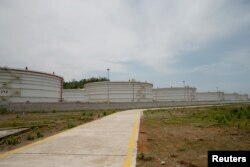 The Kyauk Pyu Special Economic Zone will cover more than 4,200 acres (17 square kilometers). It includes the $7.3 billion deep sea port and a $2.3 billion industrial park, with plans to attract industries such as textiles and oil refining. A Reuters tally based on internal planning documents and census data suggests 20,000 villagers, most of whom now depend on agriculture and fishing, are at risk of being relocated to make way for the project. "There will be a huge project in the zone and many buildings will be built, so people who live in the area will be relocated," said Than Htut Oo, administrator of Kyauk Pyu, who also sits on the management committee of the economic zone. He said the government has not publicly announced the plan, because it didn't want to "create panic" while it was still negotiating with the Chinese developer. In April, Myanmar's President Htin Kyaw signed two agreements on the pipeline and the Kyauk Pyu port with his Chinese counterpart, Xi Jinping, as Beijing pushed to revive a project that had stalled since its inception in 2009. Oil tanks are seen on Made island outside Kyauk Pyu, Myanmar, May 17, 2017. "The environmental and social preparations for a project of these dimensions take years to complete and not months," said Vicky Bowman, head of the Myanmar Center for Responsible Business and a former British ambassador to the country. CITIC said in an email to Reuters it would engage "a world-renowned consulting firm" to carry out assessments. Although large-scale land demarcation for the project has not yet started, 26 families have been displaced from farmland because of acquisitions that took place in 2014 for the construction of two dams, according to land documents and the landowners. Experts say this violates Myanmar's environmental laws. "Carrying out land acquisition before completing environmental impact assessments and resettlement plans is incompatible with national law," said Sean Bain, Myanmar-based legal consultant for the International Commission of Jurists, a human rights watchdog group. "The CITIC money was very useful for us because most people in the village need money," said fisherman Thar Sai Aung, who borrowed $66 to buy new nets. An ox cart carries construction materials at a jetty in Kyauk Pyu, Myanmar, May 17, 2017. "I don't think there's hope for me to get a job at the zone," said fisherman Nyein Aye. He had been turned down 12 times for job applications with the pipeline operator. "Chinese companies said they would develop our village and improve our livelihoods, but it turned out we are suffering every day."